A Single Port RS-232 serial adapter designed for rugged use to expand your serial communication through an available USB port on your PC or a USB Hub. Industrial-grade metal chassis that is mountable. RS232 Optically Isolated serial port. Metal mountable chassis with rugged design for industrial applications. No conflict with system functions or COM port configuration. The USB-COM-SI-M USB Single Port RS-232 serial adapter is designed for industrial applications to allow for easy serial port expansion on your system. In connecting the Single Port RS-232 serial adapter to a USB port on your computer or USB hub, it instantly adds an RS-232 serial communication port to your system. 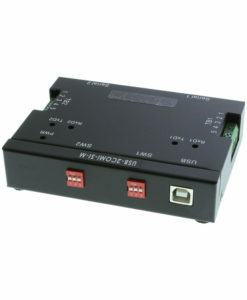 This adapter offers protection for your connected serial device with Optical Isolation and Surge Protection circuitry. By taking advantage of the system USB bus, the USB to Single Port RS-232 Serial Adapter makes it easier to add serial ports and serial devices to your system with Plug-and-Play utility and hot plug features. Plugging the USB Serial Adapter into the USB port, the adapter is automatically detected and installed. There are no IRQ & COM port conflicts or configuration issues because no additional IRQ, DMA, or memory is used as resources on the system. The adapter is powered by the USB port, and no external power adapter is required. I have been purchasing this product for over 4 years and have never had a problem. Thank you! !